In 2006, Congress first made changes to the tax code to allow qualified charitable distributions (QCD) from IRA accounts. Taking advantage of QCDs over the years has been a bit of a roller coaster ride for taxpayers because Congress would repeatedly repeal and then later reinstate the provision. To resolve this dilemma and encourage charitable giving, President Obama signed legislation in 2015 that made QCDs permanent. Before we delve into the details of QCDs, let’s first review the basics of required minimum distributions (RMD) from retirement accounts. Once you reach age 70½, you are required each year to withdraw a minimum amount from your IRA and/or employer-sponsored retirement plan (Roth IRAs are excluded). Ordinarily the Internal Revenue Service (IRS) requires that withdrawals from your IRA be included in the calculation of your gross income subject to federal income tax. When you direct a distribution from your IRA directly to a qualified charity, those funds are excluded from your gross income calculation. QCDs may be made from any IRA or individual retirement annuity, but not from a simplified employee pension, a simple retirement account or an inherited IRA. For individuals who don’t need their yearly required distributions to fund living expenses, qualified charitable distributions offer many tax advantages. Reducing reportable gross income can help taxpayers avoid being bumped into a higher tax bracket or the risk of Medicare insurance premiums being increased. Making a QCD can satisfy all or part of the yearly required IRA distribution for the year in which the contribution is made. There are limits to QCDs, so keep the word “qualified” in mind when doing your planning. Most importantly, the receiving charity must be a qualified 501(c)(3) organization. The maximum annual amount for QCDs is $100,000. If you file a joint return, both you and your spouse can donate $100,000 through a QCD. The contribution must be made directly from the IRA to the charity. The charitable organization must also provide you with written acknowledgement of the contribution. There can be no benefit to the taxpayer as a result of the contribution, even a dinner or thank you gift. 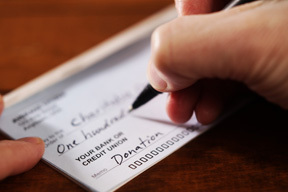 If you are planning on making a contribution, be sure to contact the charity and get information on the exact payee name that should be on the check. The QCD will not qualify if the check is made out to the account holder and the current law has no provisions to forgive these types of mistakes. The money also cannot be transferred into a non-IRA account as an intermediate step. The IRS has further qualifications for QCDs. According the IRS, “The amount of the QCD is limited to the amount of the distribution that would otherwise be included in income. If your IRA includes nondeductible contributions, the distribution is first considered to be paid out of otherwise taxable income.” When filing income taxes, you cannot take a charitable contribution deduction for QCDs, since this was already excluded from taxable income. You should consult with your tax and financial advisors before making a qualified charitable distribution, so that you can determine from an income tax, wealth management and charitable giving perspective if it would be advantageous for your specific needs.